I had the great pleasure of attending the Opening Night Preview Party for this weekend's American Craft Council Show, again at Cobb Galleria Centre, and what I'd planned to be an hour walk-through turned into catching up with old friends, making new acquaintances and quite a few delightful conversations with showing artists. The one thing that struck me strongest is the fact that many of the show participants are masters of their particular craft...they're, in fact, artisans! I can't tell you how excited I was to see Preserving Place at the show...but I'll try. I had the great pleasure of meeting Martha McMillin, founder and purveyor of Preserving Place, at an event in her store a few months ago. She's one of those people who you immediately find charming and delightful...you can't help but like her. Preserving Place is one of this year's "Inspiration Stations". And Martha is in good company. Others include The Center for Puppetry Arts, SweetWater Brewing Co., and Callanwolde Fine Arts Center, to name a few. 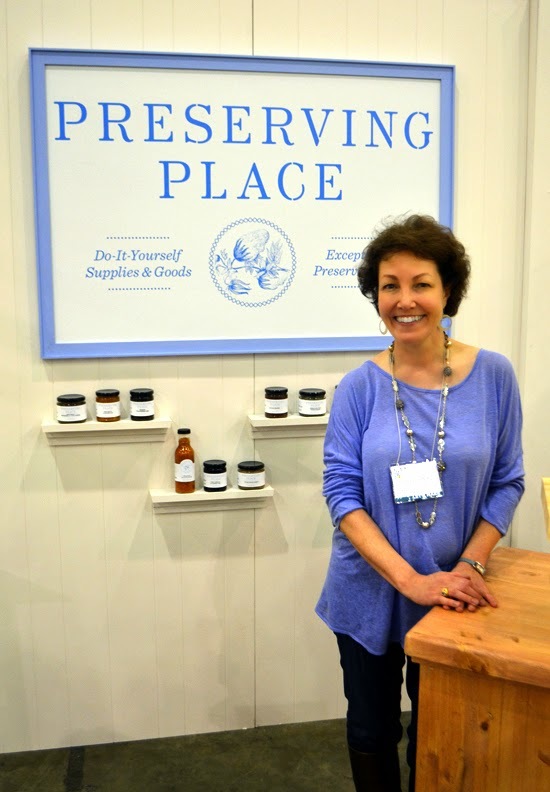 Do visit the shop, in West Midtown near Bacchanalia, and you can also see Preserving Place this year at the Peachtree Road Farmers Market and a number of other food shows in Atlanta. "Like" Preserving Place on Facebook for updates! They don't know it yet, but I picked up jars of "Tipsy Vanilla Blueberry Jam" and "Sweet Onion Confit" for friends who are visiting me from Washington, DC, this weekend. A delicious taste of Atlanta for them to take home. 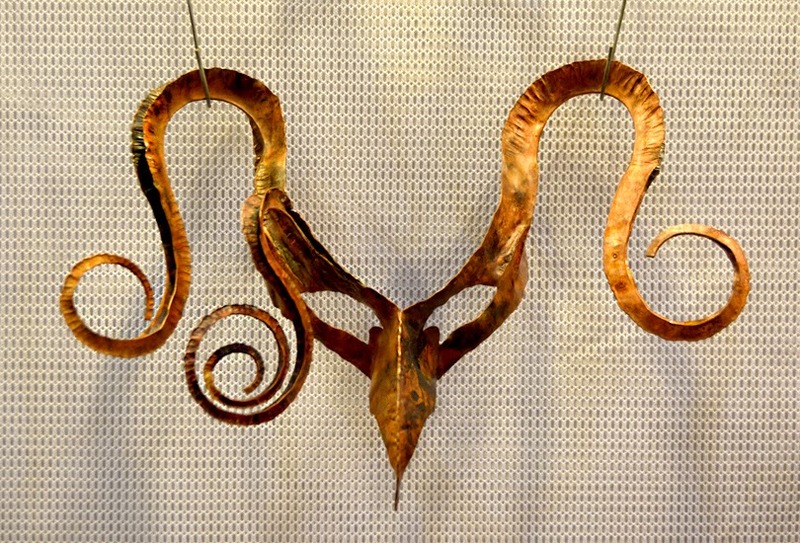 Mike Sluder, of Mike Sluder Metalworks (Booth #109), is an artist that I've admired for years. I first met him at "The South's Next Wave" exhibit in 2012 at the Museum of Design Atlanta (MODA). I've been a fan ever since. I don't know Mike outside of the occasional show, but he's the kind of person you automatically like. He's humble—even though an incredibly talented artist—and personable. And I happen to very much like his work. In fact, in talking with him tonight, I admitted that while I'm not a fan of "blue" (true, with exceptions), that I love the new bowl pictured above. And his work with bronze fascinates! 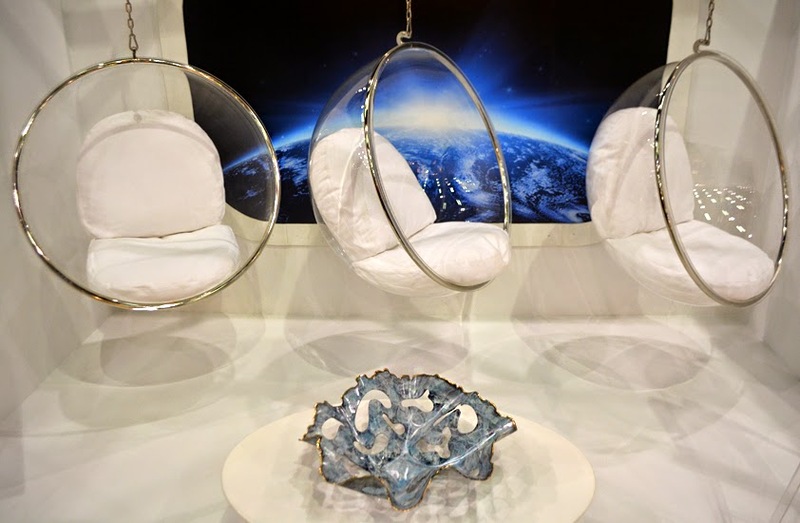 One of the features of this show is their "Make Room: Modern Design Meets Craft", of which there are several vignettes in the center of the show space. This year's rooms each include elements of earth, air, fire and water. I'm so glad that I stayed for longer than I'd originally planned. I saw the entire show—at least I walked the floor a couple of times, but I know there's a lot more to see. AND I ran into friends Dave and Brenda! They're such awesome people and totally fascinating! And I saw several members of Les Dames d'Escoffier International's Atlanta Chapter. I love those ladies! It's not very often I get to "get my geek on" in public, but Kest Schwartzman, of Vagabond Metalworks (Booth #1317), and I totally geeked out! It was awesome! I'd been by her booth earlier in the evening and then saw a lady wearing one of her creations—a lady who is going to open a French woman's fashion shop near Preserving Place sometime soon—so I had to go back over and explore again. I love the back-story of how Kest got started. She was a classically trained metalsmith, copper I think, and then one night she needed a mask for a party. The rest, as they say, is history. One of her masks made me think of the "Where the Wild Things Are" exhibit at The Breman Museum, which I mentioned, and from there we must have talked for 15-20 minutes about things to do in Atlanta. She had earlier in the day been to The Breman to see the exhibit AND went to The Center for Puppetry Arts. Kest is my kind of tourist! Yes, yes, it's true. We geeked out over masks, Wild Things, puppets and dinosaurs, too! Kest has an awesome Triceratops mask! I've always loved fashion. I've always loved dressing for success. I've always loved making a fashion statement. 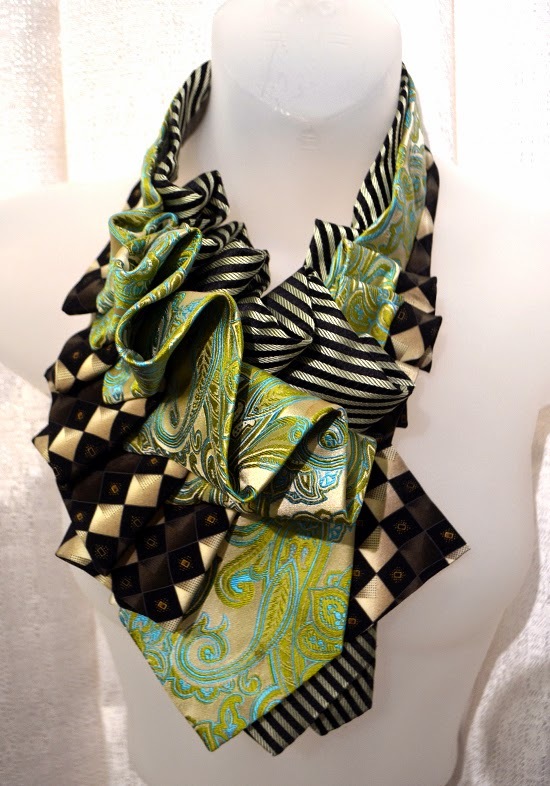 That's exactly what Lilian Asterfield's wearable art conjures (Booth #602). Designed for the established wardrobe, there were a couple that I would proudly wear to coming-up parties! They're totally awesome. Nicole—whose alter ego is Lilian—is also a painter, but in the booth I only saw the wearables. Made of half vintage ties (we had some fun conversation about those memories!) and half contemporary ties—all silk, these beauties are more than a fashion statement...they're art. She also has a more masculine series—the Sherlock & Watson—but, for certain avant-garde parties, I'd wear some of what she has on display today. Seriously, I want three or four of them. I'd almost create excuses to wear them! The ascot pictured above is the "Lime and Black", but I particularly liked the "Ivory Crossword". This is another of the "Make Room: Modern Design Meets Craft" vignettes. 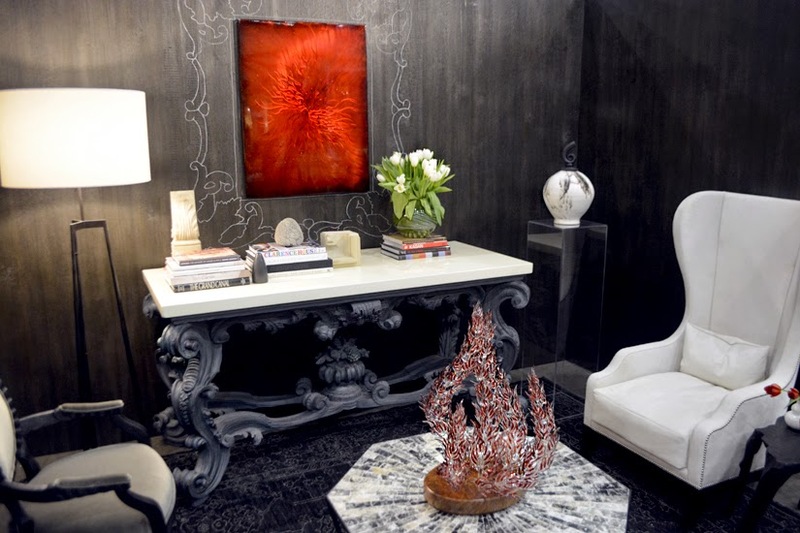 This one features Mike Sluder Metalworks—love that sculpture—and the stylings of designer Brian Patrick Flynn. Of course I love the "Space" aspect of this room design, but that aside, what's not to love about this?! I'd also like to share with you a few other favorites that I hope you'll visit when you go to the show this weekend. I'd like to offer a huge wanderlust ATLANTA "Thank you!" to Carrie Whitney of Launch Atlanta for the ticket to tonight's Preview Party. And I'd like to remind my readers that all opinions shared herein are my own. 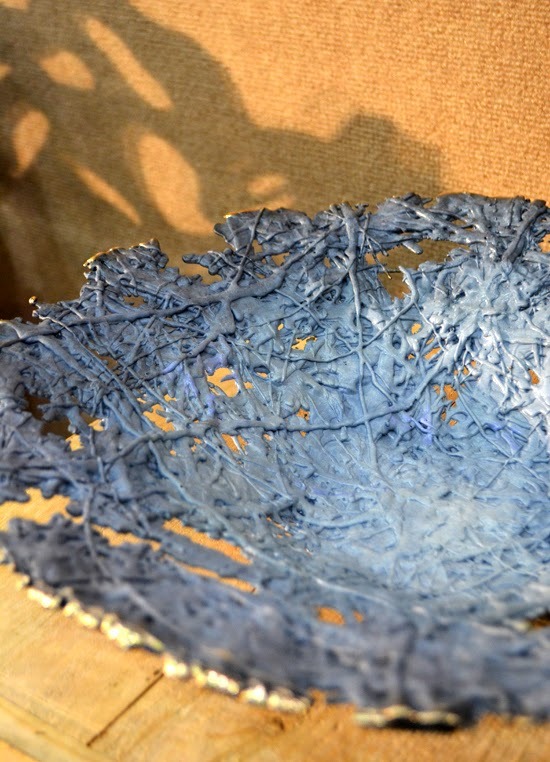 I can easily see, after two years now, the American Craft Council Show becoming an annual must-do for me. This year was even better than last, of course in part for running into people I know and making new friends and getting to talk personally with so many amazing artists...you'll do the same, I'm sure. There's so much more to this show than what I've shared here. It's definitely a must-do for all artistry enthusiasts. This year the show is Friday, March 13 through Sunday, March 15, 2015, at the Cobb Galleria Centre. I just might go back, so maybe I'll see you there!